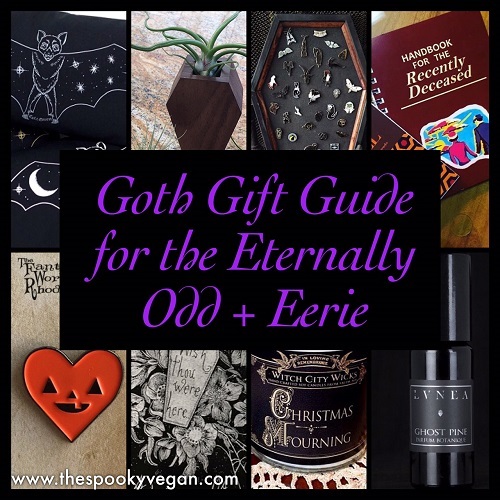 I know how hard it is to find unique gifts for your favorite darkling or even yourself, so I've compiled some suggestions for you below to make this gift-giving season easier. These are all items I would love to receive, so this gift guide doubles as a wish list for myself as well! 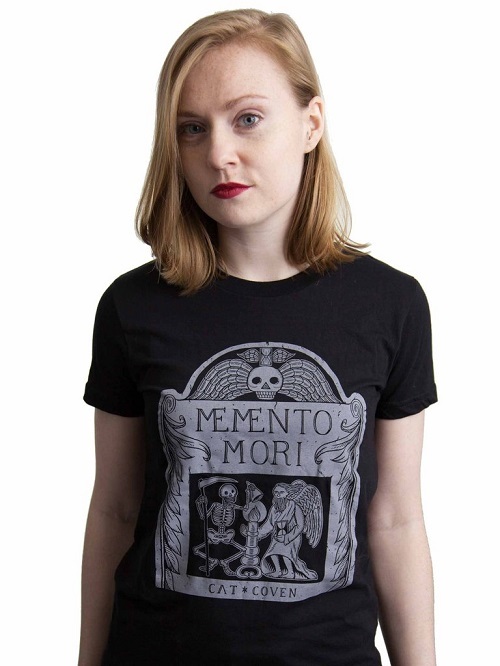 I have suggestions for creepy clothes, eerie artwork, dark decor, scintillating scents and candles, and so much more! Of course, all fabrics/perfumes/candles/etc. are cruelty-free and vegan. In addition, the most of the items below are from small businesses (and even a non-profit), so your money is going to a good place and allowing like-minded gothlings to thrive! Cat Coven's MEMENTO MORI Women's T-Shirt - I adore the designs from old gravestones, and this reproduction on a tee is just perfect! Life After Death Designs' Coffin Cork Board - Such a unique piece, this could be used to pin up notes, jewelry, or as a display piece for the oh-so-popular enamel pins! 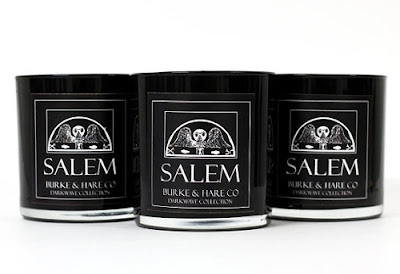 Burke and Hare Co.'s SALEM Soy Candle - I want every single one of Burke and Hare Co.'s candles (including candles inspired by The Cure, Siouxsie and the Banshees, Krampus, Edgar Allan Poe, the moon, Elizabeth Bathory, and many more! 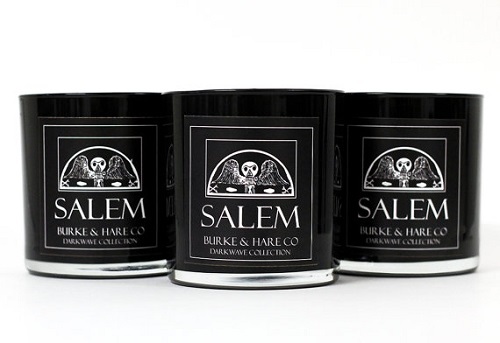 ), but their Salem scent really stood out to me - it is scented with "deep notes of patchouli dusted with balsamic resin and hints of black teas and jasmine florals. Deep and mysterious, black as midnight." Cryptic Cosmetics' Till Death Do Us Part Matte Lip Veils Collection - Aren't these lippies just gorgeous?! This is their newest collection, inspired by Joy Division and representing "eternal love, devotion, holy matrimony, and honoring our loved ones who have passed." I also love the color palette of their Gore Couture collection (unfortunately it is currently sold out, but check back for re-stocks). 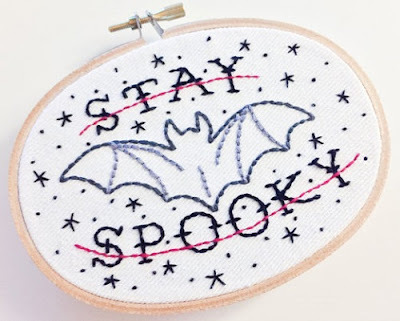 InterestinColors' STAY SPOOKY Bat Embroidery - How adorable is this embroidered art piece?! This Etsy shop has lots of other eerie embroidered artworks, including Frankenstein's monster and the Bride, Beetlejuice quotes, Haunted Mansion-inspired pieces and more! 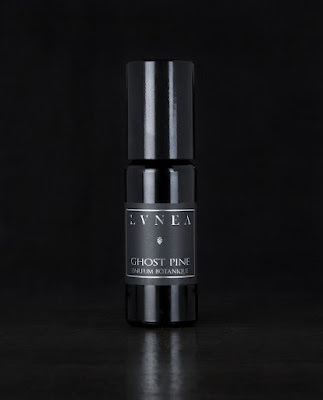 LVNEA's GHOST PINE Botanical Perfume Oil - This unisex scent smells like crisp pine needles, crushed foliage, damp moss patches, and ancient woods. The description via the website makes it sound heavenly: "The captured scent of a foggy and damp forest on an overcast day. As the soft fog rolls around the tree trunks, it chills you to the bone and let’s you know, you are not alone." 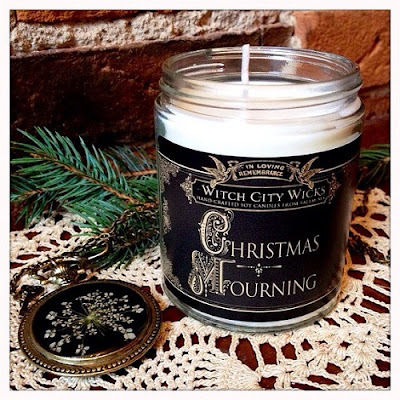 You'll be like a wispy ghost in a foggy forest wearing this scent! And of course it is also cruelty-free and vegan. Cemetery Gates Zine - I simple adore these handmade zines made with love by the gorgeous MissMuffCake! They feature cemetery photography, memento mori, fun lists, neat facts, and so many more personal tidbits that make them very special indeed! These unique zines would make a lovely gift for taphophiles (my review of volume 3, shown above, is here)! She also has several other zines, including The Stay at Home Girlfriend, vegan recipe zines, and mental health zines, all available via her Etsy. 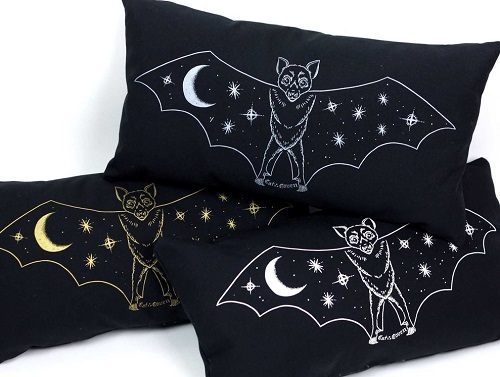 Cat Coven's CREATURE OF THE NIGHT Pillow - These come in gold, silver, or white print on a black pillow. Bats are my spirit animal and night-time is the right time, so these gorgeous designs of a starry night sky within the wing span of the majestic bat call to me! Arcana Obscura's TAPHOPHILE Necklace - A gorgeous gift for any taphophile! 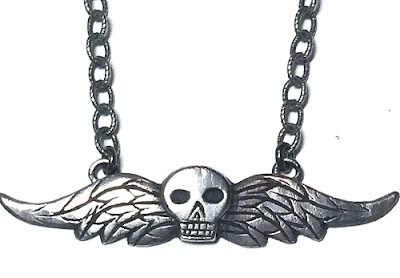 This shop carries many other astounding adornments for darklings, all of which I'm currently drooling over. Witch City Wicks' CHRISTMAS MOURNING Soy Candle - With a black and gold label inspired by Victorian funeral cards, Christmas Mourning smells like mistletoe, pine needles, sweet berries and green apples. 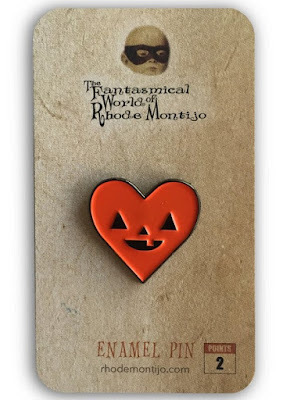 Rhode Montijo's I LOVE HALLOWEEN Enamel Pin - Calling all Halloween lovers! 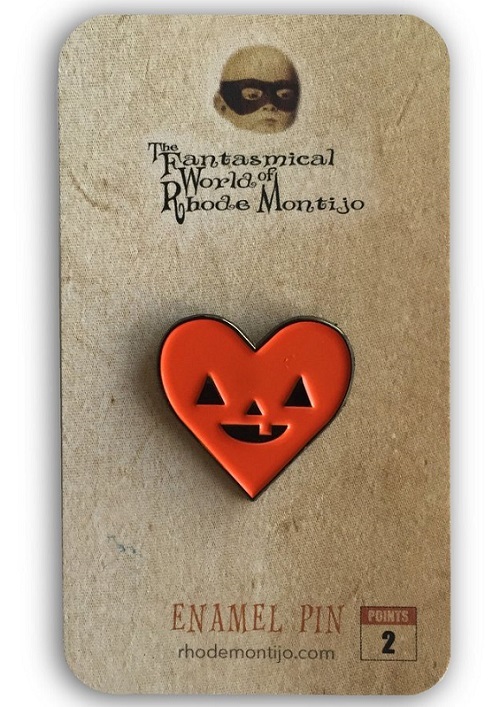 Rhode Montijo's work is playful and adorable, and this cute jack-o-lantern pin is no different - get it for the loved one that is still missing All Hallow's Eve. Bearded Lady's Mystic Museum's Overlook Hotel and Handbook for the Recently Deceased Notebooks - These would make ideal stocking stuffers or gifts for ghouls and boils that want to scribble down their mad ramblings (or gruesome grocery lists!). Bearded Lady Vintage and The Mystic Museum has tons of other boo-tiful items on their site and even more in-store (they are located blocks from one another in Burbank, California)! Black Willow Gallery's COFFIN Planters - These cute coffin planters are wonderful for nature lover's who want to bring the outdoors in. 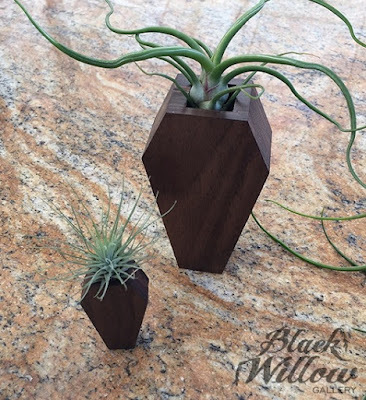 These filled with air plants are sure to brighten the homes of those with a darker aesthetic. Such a unique and beautiful gift! This company is local to SoCal and has an array of other fantastic items that would make great gift. 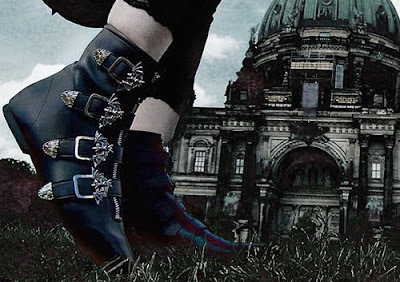 Goth Pikes Winklepickers - Order these early, since they are made to order in Germany. However, they make authentic '80s Batcave-inspired winklepickers that are to die for! To note, they have a vegan leather option for all of their styles! 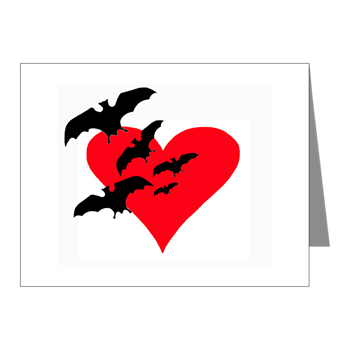 Bat World Sanctuary's I HEART BATS Cards - With proceeds benefiting the non-profit Bat World Sanctuary, the boo-tifully batty cards would be rad to gift to fellow creatures of the night (or to keep for yourself). They have lots of other goodies for bat-lovers on their site as well, and you can even adopt their bats in need to help cover rehabilitation costs for them. Earth Emporium Gift Set - This all-vegan shop has handmade soaps, bath bombs and more! 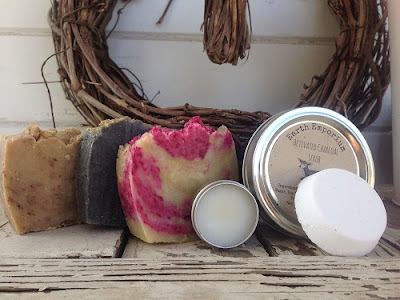 I love this $25 gift set, which includes three soaps (scents include Coffee and Cocoa, Spiced Cranberry, Apple Pie, Witches Brew, Pumpkin Pie, Christmas Pine, Peppermint with Activated Charcoal), one scrub, one headache salve, and one shower steamer. 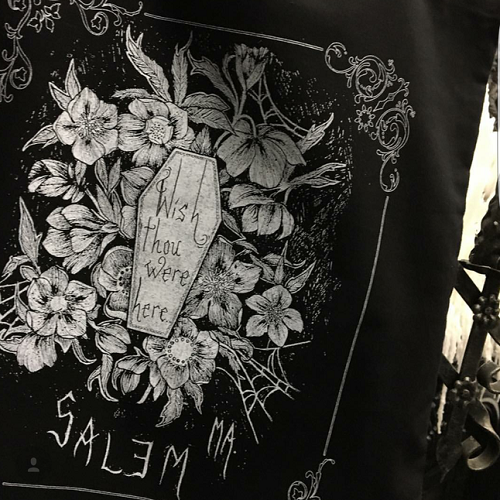 Black Veil Studio's Wish Thou Were Here Tote - Black Veil Studio is located near Salem, Massachusetts and has too many amazing art prints to post here, so I decided to feature their macabre tote emblazoned with a coffin and a "Wish thou were here" sentiment. I think this is perfect for those spooky friends or family members who you don't get to see over the holidays. Sourpuss' Gravedigger Purse - I fell in love with this bag as soon as I saw it! 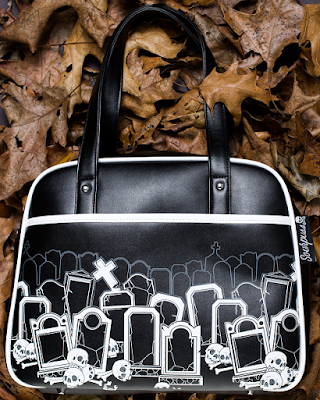 It is a roomy black bowler bag with white headstones dotting the front of it. Of course it is perfect to stash all your eerie accessories in and for taking cemetery strolls. 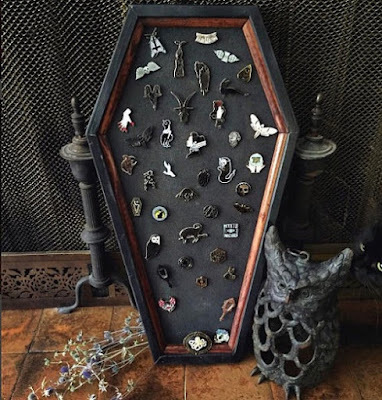 Burial Ground's Jewels - The striking jewelry looks like it was plucked straight from nature and transformed into rings, neck adornments and more by a wood wytch. Shown here are their Hinterland Stacking Rings, representing past, present, and future. 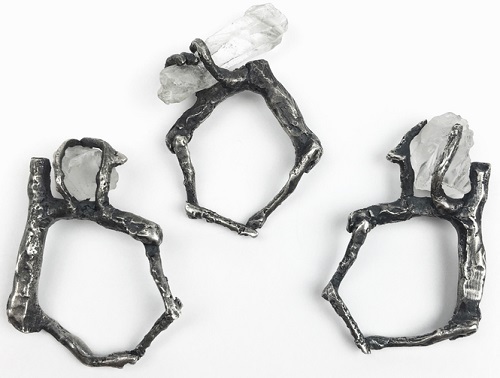 These sterling silver rings are cast from twigs and set with raw quartz crystal points. For more ideas, you can check out last year's gift guide, featuring lots of other fantastic small companies and artists, HERE. What is on your Creepmas wish list this year? I have Arcana Obscura's Taphophile ring.. absolutely love it! Black Veil Tattoo is one of my bucketlist artists..someday! !